Trying To build a home on land that has an agricultural tie can be costly and time consuming for anyone not working in an agricultural business. An agricultural tie can be attached to land or buildings that are used in the agricultural business. A condition can be set on the land or building whereby anyone purchasing the land, house or outbuilding must work in the industry. It protects those working in the farming/agricultural profession so that it isn’t taken over by people just wanting a nice home in the country. Work will then stay in the area and hopefully homes are available for the workers as well. Sometimes the tie is added when local authorities wish to build on greenbelt land and as properties are purchased afterwards by non agricultural workers the tie needs to be lifted. This also affects those wishing the knock down the property or perhaps building in the garden of the property that has the tie. Not everyone who wants to build on land previously used for agriculture is out to destroy the countryside and take work from the locals. With less work in the countryside and many farmers diversifying it may be that the time has come to lift more Agricultural Occupancy Conditions and make way for locals in non farming jobs to be able to build their homes in the community they grew up in. There again the green belt has to be protected and these conditions do just that. The Local Planning Authority is the first place to visit in order to find out if the restrictions can be lifted. The Town and Country Planning Act 1990 is worth reading as it shows why such ties are put upon land and housing. It also allows the planning authority to negotiate with the builder or owner so that they may be able to rebuild a property or build on land with a tie attached. 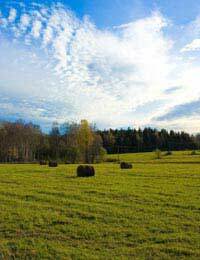 Whilst the land or indeed a property has an agricultural tie imposed upon it there may be problems obtaining a loan to buy the property (or land). The purchase is usually cheaper than similar land or homes because of the tie and if animals were kept you should continue to do so in case you are in breach of the original planning consent. There are consultants that can advise on these situations and take the buyer through the tricky mine field of law and negotiations. It may be that you will have to agree on a design of house that is not entirely to your taste or indeed form a nature reserve or something that benefits the local community. Never think that you are able to do these negotiations yourself, they are tricky and you could end up with land that you cannot live on or built on. When purchasing your land or house that has an agricultural tie never take the word of the estate agent or seller but visit the local planning authority and check the facts for yourself before parting with your money. A little time spent now will be invaluable in the future.